On November 19th, NOAA Fisheries hosted a meeting with local water managers, biologists, and other interested people to discuss a 'steelhead rescue plan.' This is in response to ongoing fish strandings throughout the region. This has been an issue in the Ventura River as documented on this blog. The discussion focused on coordinating communications and actions with NOAA staff responsible for this endangered species. 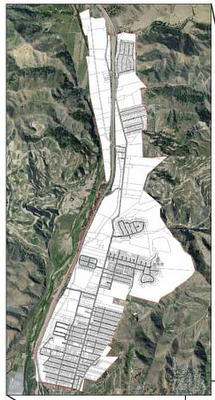 The Ojai Valley News reported in detail on this meeting here. 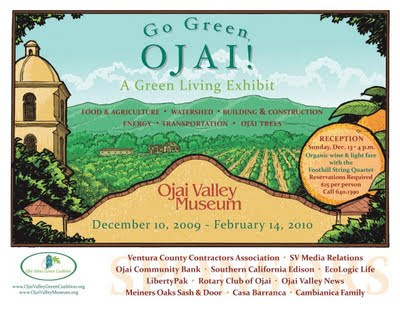 The Go Green Ojai! exhibition will feature ways we can live more sustainably in our everyday lives in the Ojai Valley, from auditing our energy, planting trees, supporting our farmers (and home growing food as well), and restoring our wetlands and waterways. There will be a "cutaway" green home exhibit showing alternative energy, building materials, energy sources, landscape features, and more! The Watershed group has put together a large (6 ft x 8 ft) display that describes our watershed and water supply. Tom Bostrom has single-handedly compiled the graphics and information for this great display. The exhibit will also feature information on 'Ocean Friendly Gardens' and other ways to protect our watershed. The exhibit runs from December 10 to February 14, and the museum hours are Thursday and Friday, 1 to 4 PM, Saturday 10 AM to 4 PM, and Sunday, 12 noon to 4 PM. Last Wednesday evening I presented Watershed Revolution to the Westside Community Council. The Westside community lies within the lower Ventura River, and has a vested interest in re-connecting with the river. The community was cut off from the river when the Corps of Engineers levee was constructed in the '50's, and to an even greater extent when Caltrans completed the 4-lane Highway 33. The Ventura River is an important focus as the westside works on its community development plan. 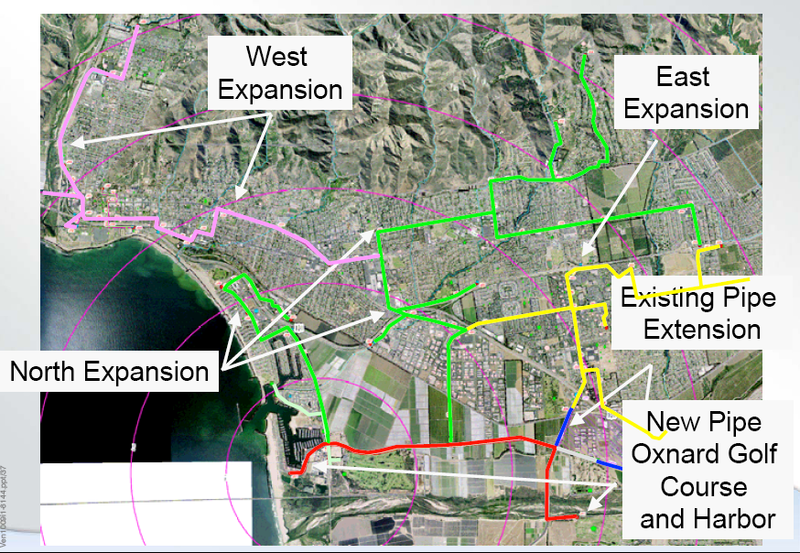 To this end, a student group has been working on a Ventura River Parkway plan, in coordination with Trust for Public Land and with funding from the California Coastal Conservancy. Unfortunately the state budget crisis delayed this project, but the Ventura River Parkway plan will be presented in early 2010. 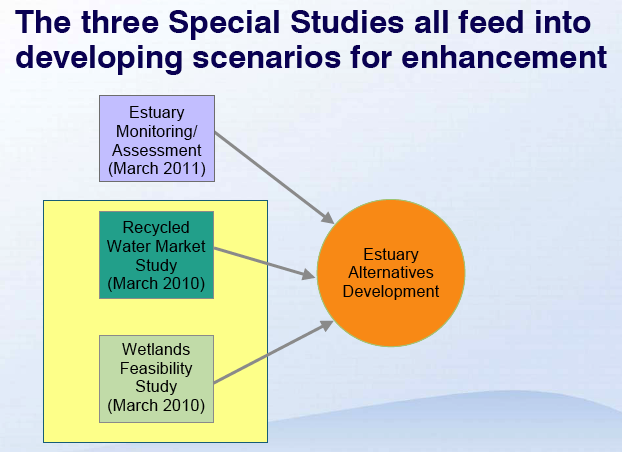 On November 10, 2009, the City of Ventura hosted a workshop on the Santa Clara River Estuary Special Studies. 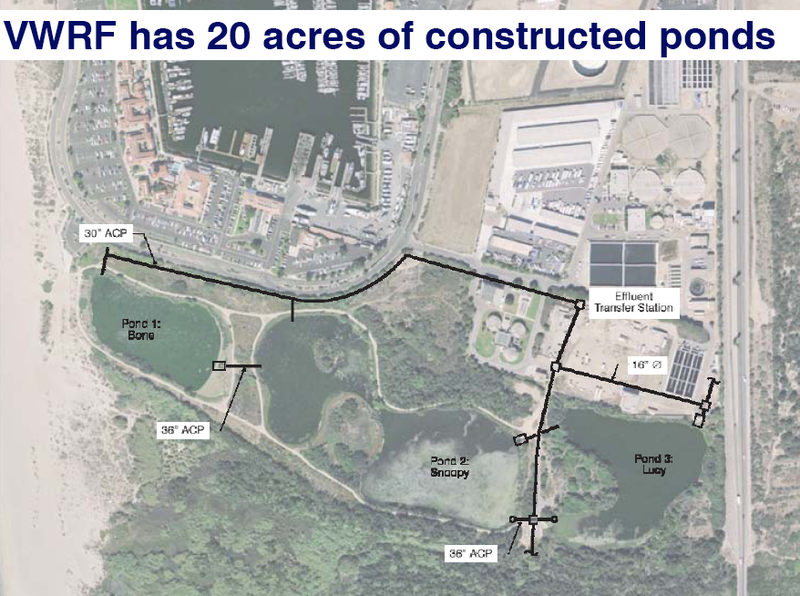 The city's sewage treatment plant currently discharges 6.5 MGD (million gallons per day) of tertiary treated wastewater into the Santa Clara River Estuary, and has the capacity for 14 MGD. This is one of the last remaining estuary discharges in the state. Issues associated with this discharge include impacts of nutrient-rich water in the estuary and the artificial hydrology created by this volume of water. With this discharge, the lagoon fills up and breaches on a more frequent basis than it would under natural conditions. The estuary is habitat for a variety of threatened and endangered species, and wastewater flushing into the surf zone affects ocean water quality. These studies are a requirement of the Regional Water Quality Control Board as a condition of the city's wastewater discharge permit. The aim is to investigate opportunities for enhancement of water quality. Information is available on the city website here. 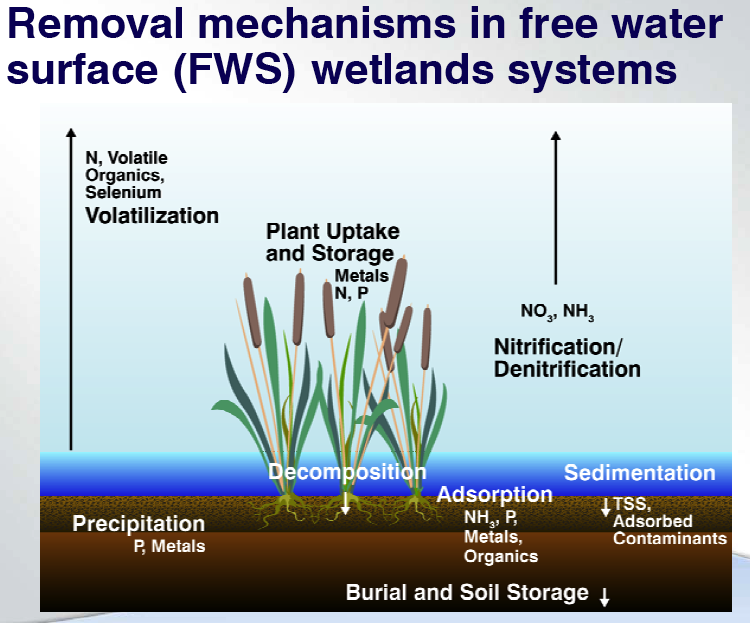 The wetlands and reuse studies will identify opportunities for diverting water from the discharge point for reuse or creating additional wetlands to remove pollutants. The current system reclaims approximately 1 MGD which is reused on the two nearby golf courses and other urban landscaping. 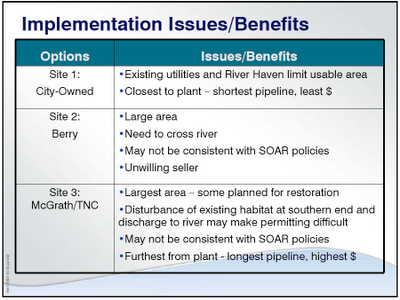 The reuse study looked at potential markets for reclaimed water within a 5 mile radius. 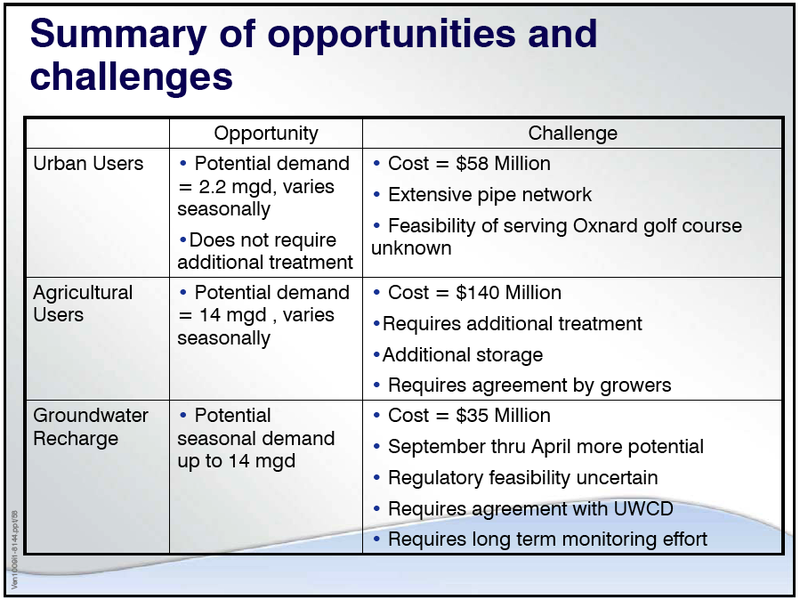 Possibilities include urban and agricultural reuse, as well as groundwater recharge. 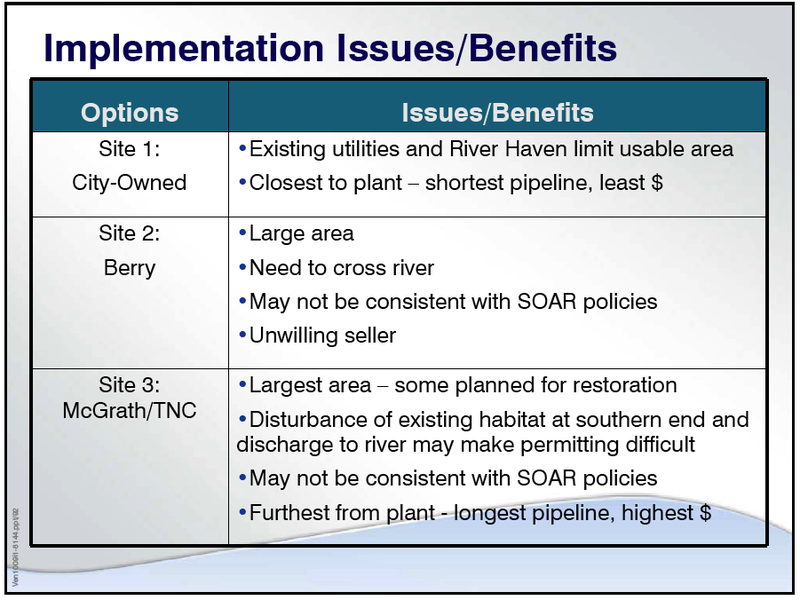 The bottom line: cost is high to construct a system that would provide for any significant reuse, with estimates from $35M to $140M as summarized in this table. 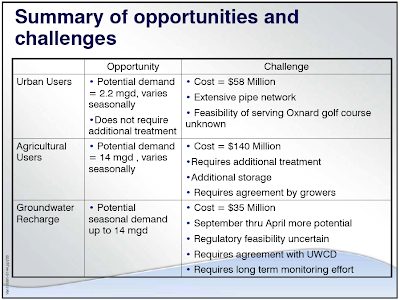 Major piping and pumping infrastructure is needed to deliver reclaimed water, and agricultural reuse would require an expensive and energy intensive Reverse Osmosis (RO) treatment plant. The city currently operates a series of ponds that help treat the effluent before it enters the estuary. Current effluent nitrate levels are over 15 mg/l. The city is planning on spending $22M at the treatment plant to remove nitrogen to the regulated limit of 10 mg/l. The study identifies 3 potential sites for additional constructed wetlands. The aim would be to reduce nitrogen from the effluent. There was discussion after the presentations. Stakeholders were given an opportunity to place 'dots' on the chart below to express their preference for future discharge scenarios. The 'Volume' axis allows a sliding scale between all 'onsite' discharge as it currently exists, or all 'offsite' through reuse. 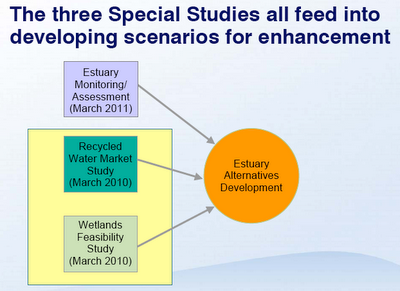 Enhanced quality infers additional treatment wetlands. It seems the majority prefers enhanced water quality and at least half the volume discharged offsite. What was not recorded was my comment that climate change and sea level rise may soon make the current location of the treatment plant infeasible - planning should consider opportunities to decentralize wastewater treatment to facilitate reuse without the need for complex pipelines and pumping systems. 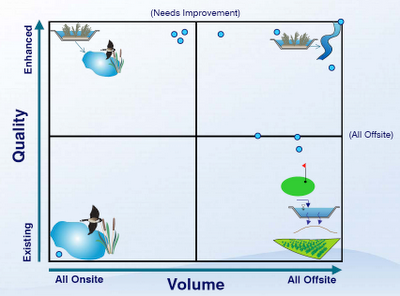 Supply-side analysis should be conducted to consider on-site reuse of greywater throughout the city. For a relatively small investment, a greywater retrofit program would reduce the wastewater volume at the treatment plant, reduce the city's overall water demand, and create lots of local jobs in the process. The next stakeholder meeting will be in February 2010.